Should we Get a Rabbit as a Pet? Rabbits are the third most popular pet in the UK but sadly many people see rabbits as ‘easy pets’ that you can just keep in a hutch at the bottom of the garden. Nothing is further from the truth – a rabbit will need as much commitment from an owner as a cat or dog if it is to live a healthy and happy life. This commitment is also a long term commitment as the average life span of a rabbit is 7 to 9 years. Rabbits are very sociable creatures and like to live in groups. When kept as pets they need a companion to interact with. Guinea pigs do not make ideal companions as they have different behavioural traits and cannot communicate effectively which could lead to the guinea pig being bullied by the rabbit. Guinea Pigs and rabbits also have completely different dietary requirements. Two rabbits together is ideal, however, two boys together will often become very aggressive and fight so ideally a boy and girl or two girls make the best pairing. It is often thought that rabbits make ideal pets for children as they are cute and cuddly but rabbits are ground dwelling animals and can often feel insecure when their feet are off the ground. This insecurity can lead to them struggling and being dropped which can result in limb and spine fractures. Having said that, rabbits love being stroked. If you put in the time interacting with your rabbit whilst he/she is on the ground you will have a very happy bunny. Rabbits should not be kept in a small hutch – they need a large hutch and a run. Rabbits feel happiest and most secure when they can stand on their back legs and survey the surrounding area for predators. Their housing and run should be tall enough so that they can not only stand upright but also be able to hop and jump around. Rabbits also like to burrow. Rabbits need space to thrive so give them as much space as you can. They will need a secure sleeping area. The hutch shouldn’t be placed in direct summer sunlight or where it is exposed to draughts. Rabbits eat grass and hay– it forms up to 90% of their diet in the wild. Rabbits teeth grow constantly and chewing grass helps to wear them down. Grass also maintains a healthy intestine and provides the calcium they need for healthy teeth and bones. Rabbit food should be given as a supplement but only the pelleted version and not the muesli type. When provided with muesli type foods, rabbits will just select the pieces they like so will not get a good balanced diet. Vegetables also make good treats. As a general rule they should be fed their own body size in hay or grass, their head size in vegetables and a small handful of pelleted rabbit food. Rabbits must always have access to fresh clean drinking water. Rabbits need to be vaccinated once a year against myxomatosis and viral haemorrhagic disease (VHD) – this is now available as a single vaccination from your vets. If you have a combination of boy and girl rabbits you will need to have them neutered at around 6 months of age. Neutering (spaying) female rabbits also prevents uterine cancer which is very common in rabbits. As we said earlier, rabbits teeth grow continually and if they do not get enough access to grass to keep them worn down they will need to have them clipped at a vets. Certain breeds, such as lion head rabbits, also have short jaws which means their teeth can easily become misaligned. Dental problems are quite common in rabbits and often rabbits with dental problems are unable to keep themselves clean which can lead to other issues. Dirty bottoms attract flies which lay eggs in the dirty area. The eggs turn into maggots which burrow into the flesh of the rabbit. This is a horrible condition known as flystrike. It is important that you spend time with your rabbit every day and during this time check that your bunny is clean and dry. 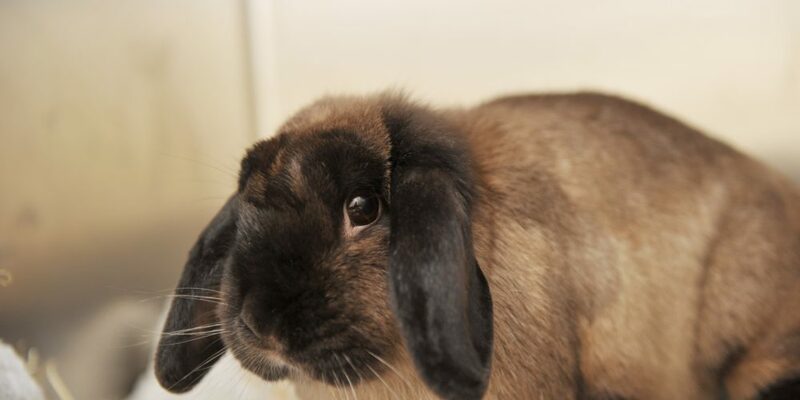 Don’t be put off – rabbits are lovely and affectionate and can make ideal pets but you need to be aware of their requirements and be committed to spending time with them every day to ensure that they are happy and healthy.